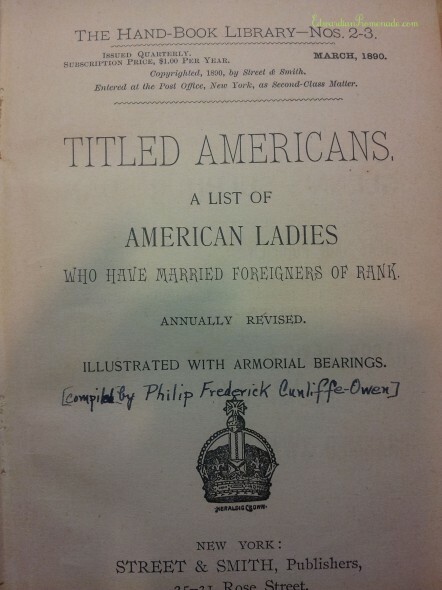 The American Heiress is one of my favorite topics to cover when speaking about the Edwardian Era–and an American heiress is the heroine of my latest book!–so I was ecstatic when I finally tracked down a copy of the almost mythical quarterly periodical, Titled Americans. In this slim book is a list of all American heiresses who wed titled Europeans, as well as a “stud book” of elgible unmarried peers and aristocrats (with a strong emphasis on the British aristocracy), their professions, their estates, and their incomes. You can imagine how many social-climbing Americans poured over this magazine every year, plotting their assault on impoverished European aristocrats and laying siege to any who showed a hint of (financial) weakness. Below you will find a few entries I photographed specifically for you all! Click on the photos for their full size. Get your own copy of Titled Americans, 1890: The Real Heiresses’ Guide to Marrying an Aristocrat! And now for the giveaway! Shire Publications sent two darling hardcover fascimiles of The Gentlemen’s Letter Writer (originally published in 1890) and Complete Etiquette for Ladies (originally published in 1876). Both books were published to help the rising middle classes and nouveaux riches navigate the social niceties of staying in hotels, courtships and social calls, as well as how to write the perfect letter to one’s solicitor or the headmaster of your son’s public school. One person will win both copies, so leave a comment below to enter! The contest will close August 10th at 7 PM PST. Ah – this is fascinating! I would LOVE to read more about the social climbers of the 1800’s! Oooooh! I’d love to read both of those books. Please enter me in this giveaway! Thank you. 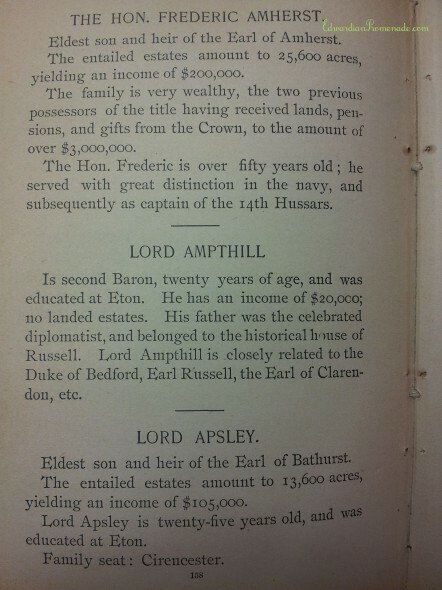 Sadly, it looks like only one of the gentlemen listed above was snagged by a rich American heiress – the earl of Craven, who married Cornelia Martin, daughter of a rich American banker. He drowned at Cowes in 1921. Interesting how many of these titles have fairly recently gone extinct. 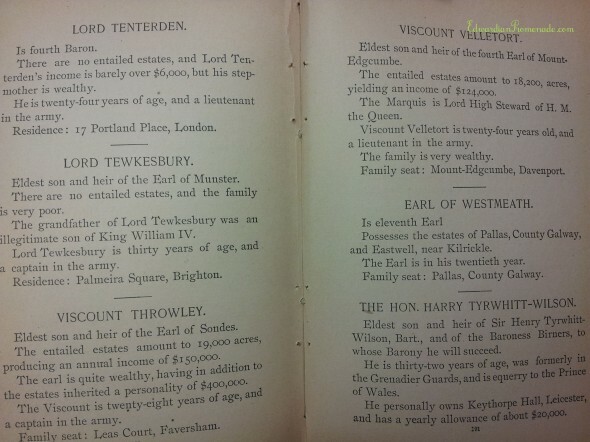 I’m not sure I’d want to be known as the “Viscount Cantelupe”. 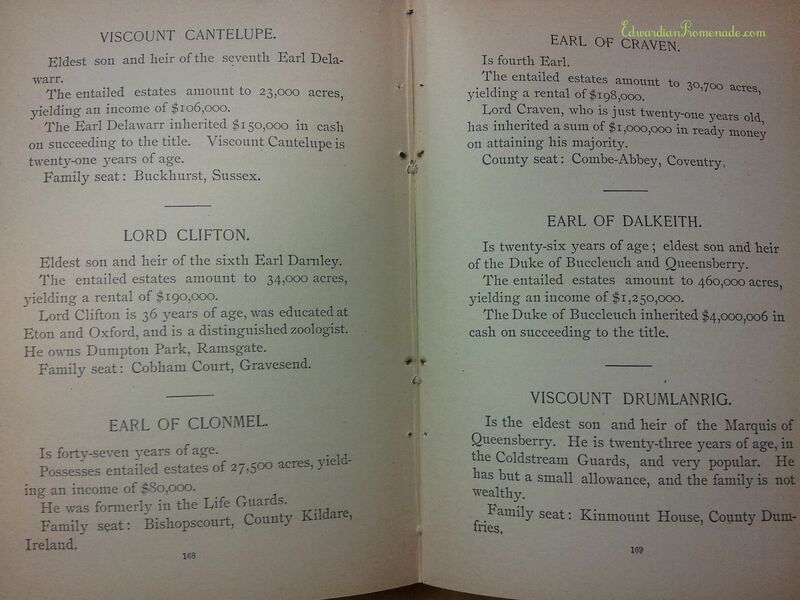 I’d love to win the two 19th century writing etiquette books as part of research for my Victorian novels. I love etiquette (and the books that talk about it). I hope I win! I’m sure those books would be very interesting reads. I’d love to get the chance to read them! 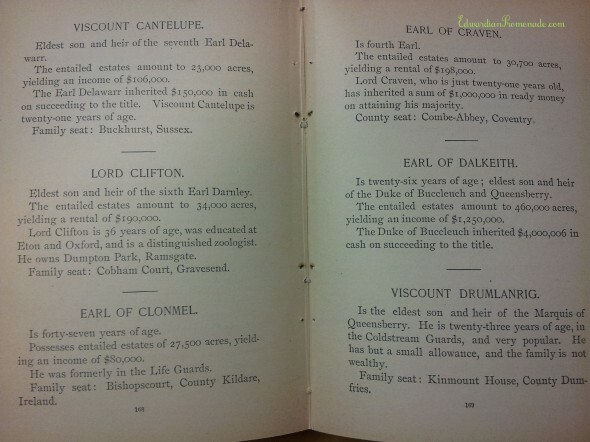 I have Cantilupes in my family tree, so that name caught my eye – of course, mine are a thousand years ago, so the family fortunes have been through a lot between the long-ago ancestor and the Edwardian-era viscount. 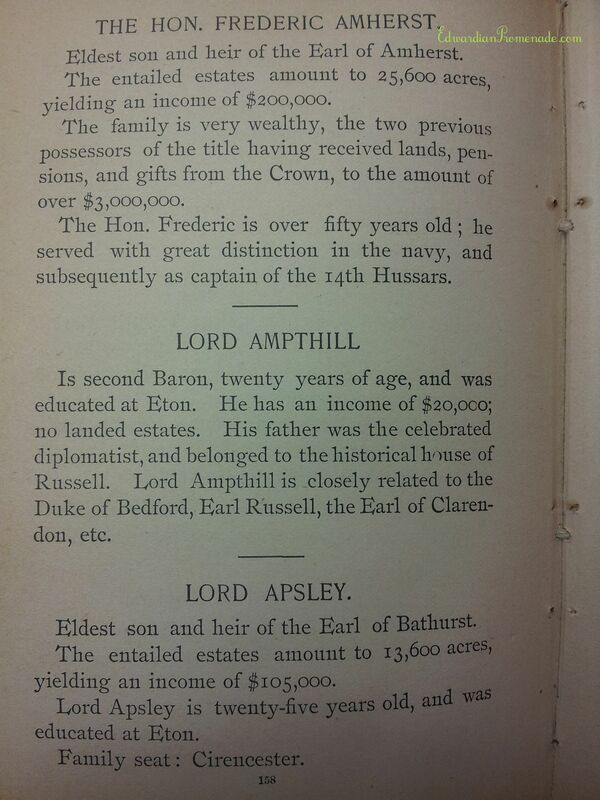 I’d love to have a copy of the book listing my distant cousin! I *love* these precursors to Emily Post. I’ve read one or two from this era, but would dearly love to read & own these, especially because they look they they have wonderful period illustrations. Count this Victorian/Edwardian freak & graphic artist in, please. And many thanks. Great finds! I’d love to read them. Victorian etiquette is fascinating! Please enter me in the giveaway! Etiquette of the Victorian / Edwardian time period is always of interest to me. The books sound great! Trying to leave a comment, but the captcha words are really hard to read! don’t know if my previous one worked or not. I love these old books… So many wonderful things to cull from them. I collect old books, magazines and periodicals. My husband’s late-aunt left me all of her Edwardian Era mementos and scrapbooks from the teens, the 1920s and early 1930s. Reading through them is enlightening. Eye opening as to how much women have changed, and how much we have not changed over the years! For my own opinion it was only fair, the British invaded America and then the Americans invaded Britain! What a great update and chance to win a book! Even though those American girls who married into the elite weren’t treated very nice by their in-laws! It can’t have been funny to be the American wife! Such a neat post. Love the fact that you hunt for these treasures. Thank you for the opportunity to win. Wow, it’s so interesting to learn all this stuff, and to read about people in this way. I’d love to get the etiquette book too, it would be great help when writing. I hope I win too! What an interesting set of books. Count this Victorianist in. I love social history and usage, and etiquette is often the best of it. There’s something very charming about seeing what people are told to do — it makes it entirely possible to infer what people were in fact doing, which is often the more interesting component. 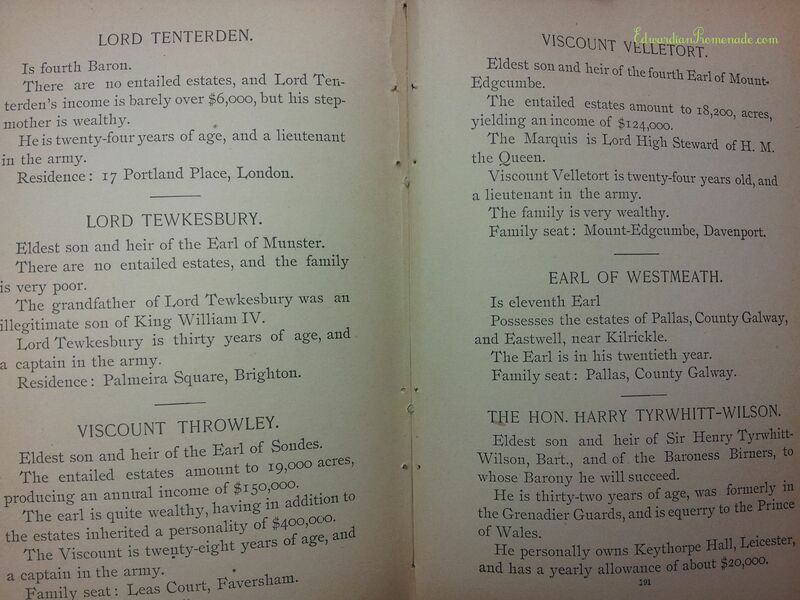 I’m guessing Lord Tewkesbury mightn’t have minded some American millions! Lucky you finding one of these. The world doesn’t want to know what I would have been like if I’d been a wealthy American mother in the Edwardian period–probably an Edith Wharton character on acid. As a historical romance enthusiast, I find these books fascinating and valuable. What a wonderful piece of history to cherish, and how intriguing to have this exclusive glimpse into the past. I am more than a little exciting about this giveaway. Thank you for the opportunity to win a treasure. Oh, these two books would be an amazing help for the novel I’m writing now! I have started to teach etiquette in my high school health classes. I would love to have these books as a historical (hysterical?) reference to use there. Please enter me in this contest/give-away. Looks so interesting! Ahh…etiquette books! Essential reading for any proper young lady or gentleman, n’est-ce pas? Thank you for offering the prize of these two books to some lucky soul — and for your splendid site and newsletter. Looks like the Earl of Westmeath is a prime target. He’s young and no income is mentioned. Time to start throwing marriagable daughters at his feet until he trips over one. Ah, a concerned mother’s work is never done. PS, please enter me into the book drawing. What an interesting read these 2 books will be! I’m enjoying reading all that I can here. Thank you for the opportunity to possibly win this set of books. What a hoot! Perhaps I could become more ladylike if I read these books, and Himself more lordly if I read them to him? Thanks for such a neat contest. This is a wonderful find. As a matter of fact, one of my characters in my MG mystery set in Victorian England “married up” and another is an American who married a Lord. I would love either one of these wins. I’d love to give these books a good home! Thank you for writing such a lovely blog! I would love to win the etiquette books. I am engaged in the futile task of trying to restore formality to an increasingly informal world. Thank you for offering them; it quite generous of you. I actually can’t tell you how much this book would mean to me and my dissertation ON American heiresses. Fingers desperately crossed!!! !